A Kaduna-based non-governmental organization, Legal Awareness for Nigerian Women (LEADS-Nigeria) has cautioned electorate in Kaduna State to desist from making petty personal requests from their state and federal lawmakers. Overtime, register books at various constituency offices showed that, high number of visits recorded were personal requests such as school fee, hospital bill, naming ceremony, feeding allowance and even money for marriage ceremony among others. Executive Director of LEADS-Nigeria, Mrs. Rebecca Sako-John who stated this during an interactive session with Kaduna legislators and constituency members over the weekend submitted that, such requests would hinder constituency projects that will be beneficial to all thereby slowing down development and growth of local government areas. According to her, lawmakers were complaining bitterly over the development, leading to their withdrawal from their constituencies which was not supposed to be. To her, “the ideal thing is that, they supposed to hold constituency meetings. But constituency offices are not functional in some constituencies due to too many personal requests by the community members which they say difficult for them to meet. So they cannot easily and freely go to the constituency and engage with the people. According to her, her NGO has begin the implementation of the Voice to the People (V2P) project in Kaura , Soba, Giwa and Jaba Local Government area of the state. V2P is one of Christian Aid projects in Kaduna where communities are equipped with required skills to prioritise their needs and relay same to their policy makers as effective ways of making their requests known for possible intervention. Mrs. Rebecca then called on the constituency members to adopt the method of using social media platforms to reach their representatives in case their mobile phone number suddenly not reachable. 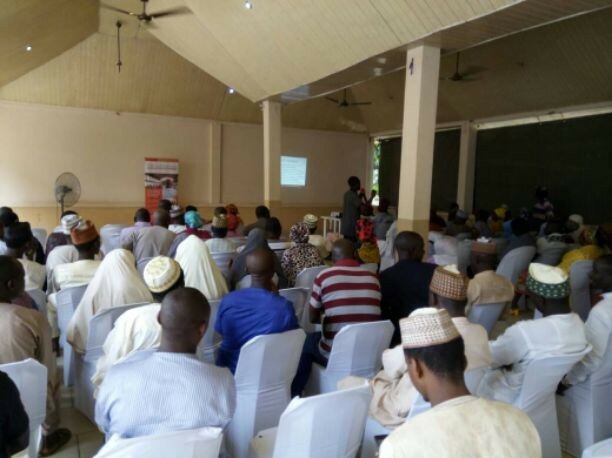 “Our partners form the local government areas finding it difficult to meet the elected officials and we know that one of the functions or role of an elected official is to rub mind with people of his constituency, collate their developmental needs and help them to pass it to the relevant authorities for action. “We have brought together the legislators and constituents to interact so that they know what their development needs are, with the sole purpose of them meeting those needs. “The needs are prioritize and put in a document called Community Development Charter (CDC). What we are trying to do is to make constituents reduce making of personal demands from the legislators. “The lawmakers just act based on the things they have think people will have interest in. Ideally, the constituency meeting should have been for general and not picking up someone they think they are comfortable with. “We want them to have a functional office, and meet people in reality and not a cross section of people that they are comfortable with and also meeting the needs of people as they were been told and not just because of what they think”, she explained. One of the locals from from Danmahawai community , Giwa, Murja Mohammed asked the lawmaker representing her constituency to provide more staff in the Primary Health Care centre PHC in her community. She also wanted girls in her community to be encouraged and supported to go to school through scholarship, while providing skill aquisition for women. In attendance were lawmakers from Giwa East, Hussaini Musa and his colleague from Giwa West, Gambo Nuhu while others were represented.